ANN ARBOR, Mich. — Should teenagers be able to hit the snooze button one more time before school? Ask their parents and half say they would support later school start times, according to today’s University of Michigan C.S. Mott Children’s Hospital National Poll on Children’s Health. More schools across the country are exploring delayed school start times as research shows benefits for adolescents’ physical and mental health, including reduced risks of obesity and depression. The poll was conducted in November/December 2014, following last year’s recommendation from the American Academy of Pediatrics (AAP) that middle and high schools start at 8:30 a.m. or later. 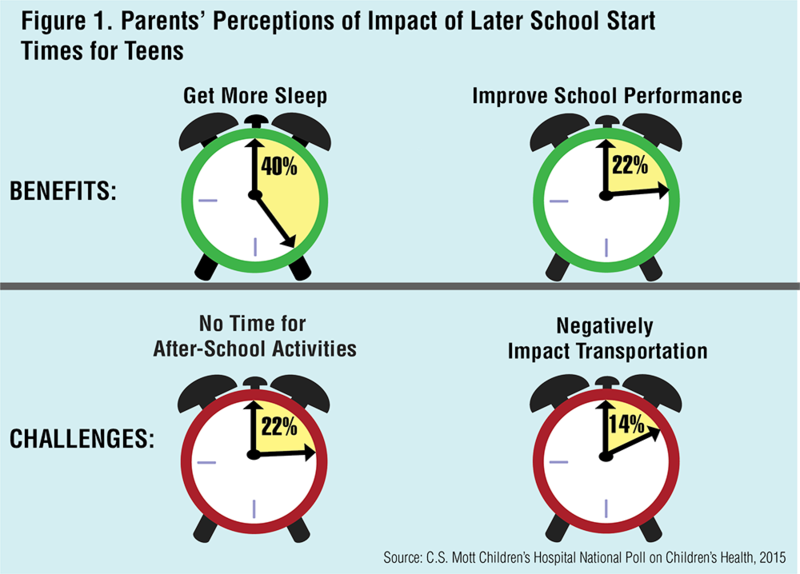 Among the national sample of parents with teens aged 13-17 whose middle or high schools started before 8:30 a.m., about 2 in 5 believed later start times would allow their teens more sleep and 1 in 5 said it would improve school performance. Meanwhile, others worried about how later start times would affect schedules and logistics, with 1 in 5 parents saying a delayed start would not allow enough time for after-school activities and 1 in 7 expecting the change to negatively affect transportation issues. Twenty-seven percent of parents said they would only support the later time if it didn’t impact school budgets while 24 percent would support the change regardless. “Teenagers are chronically sleep-deprived and that can negatively impact their health and well-being. We know teens are biologically wired to have later sleep cycles, which has raised the question of whether school start times that align to adolescents’ natural sleep rhythms could help improve health outcomes,” says Matthew M. Davis, M.D., M.A.P.P., director of the National Poll on Children’s Health and professor of pediatrics and internal medicine in the Child Health Evaluation and Research Unit at the U-M Medical School. “The idea to delay school start times is still fairly new, and our poll shows that parents seem conflicted about whether or not it’s the right move, “adds Davis, who is also professor of public policy and public health at the University of Michigan. The AAP recommends that adolescents receive 8.5-9.5 hours of sleep each night. Research shows that the natural sleep rhythms for teens shift up to two hours later after the start of puberty, meaning they sleep later and wake up later than younger children. Lack of sleep has been linked to mental health problems, increased risk of motor vehicle accidents and a decline in school performance. The report found that only 20 percent of parents had heard about the new AAP guidelines recommending later start times for school but 71 percent of parents agreed with the guidelines once they were aware of them. The debate over school times has been seen in communities across the country, most recently in the news in Rockville, Maryland where parents and students staged a “sleep-in” protest with sleeping bags and pajamas to help persuade the Montgomery County Board of Education to delay start times. A handful of other communities– including Ann Arbor, Mich. where the poll is conducted – are also exploring the option. Broadcast-quality video and high resolution infographic available with this story. Data Source: This report presents findings from a nationally representative household survey conducted exclusively by GfK Custom Research, LLC (GfK) for C.S. Mott Children’s Hospital via a method used in many published studies. The survey was administered in November/December 2014 to a randomly selected, stratified group of adults with a child 13-17 (n=636), from GfK’s web-enabled KnowledgePanel®, that closely resembles the U.S. population. The sample was subsequently weighted to reflect population figures from the Census Bureau. The survey completion rate was 51 percent among panel members contacted to participate. The margin of error is ±1 to 5 percentage points.